If you’ve chosen Jamaica as your Caribbean destination, then you’re in for an exciting adventure on this unique island. Away from your villa or hotel room, you’ll find scenic natural beauty mixed with a distinct island culture that is unforgettable. Here you can stroll along the beach, swim underneath waterfalls, head to a reggae club, or dine at a great Jamaican restaurant. There’s never a shortage of things to see and do, and you can use the information under this tab to help you plan your vacation in Jamaica. Blue Mountain coffee - considered by many to be the best in the world. Jamaica, one of the largest Caribbean islands, was inhabited by Arawak natives. When Christopher Columbus arrived on the island in 1494, he claimed the land for Spain. A few decades after Columbus’ death almost all Arawaks had been exterminated. Spain held the island against many buccaneer raids at the main city, which is now called Spanish Town. Eventually England claimed the island in a raid, but the Spanish did not relinquish their claim to the island until 1670. Jamaica became a base of operations for buccaneers, including Captain Henry Morgan. In return these buccaneers kept the other colonial powers from attacking the island. Africans were captured, kidnapped, and forced into slavery to work on plantations when sugarcane became the most important export on the island. Many slaves arrived in Jamaica via the Atlantic slave trade during the same time enslaved Africans arrived in North America. During this time there was racial tension, and Jamaica had one of the highest instances of slave uprisings of any Caribbean island. After the British crown abolished slavery, the Jamaicans began working toward independence which was achieved in 1962. 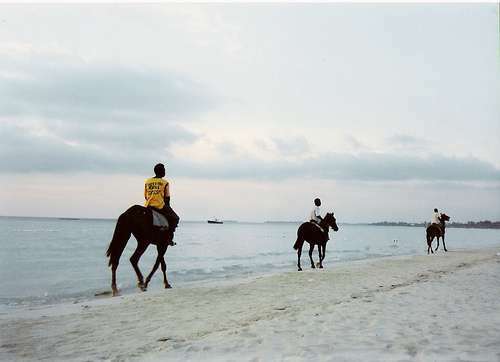 What better way to explore Jamaica's scenic country-side and white-sand beaches then by horseback. This family-friendly excursion will takes visitors across pastures and near waterfalls. Ride along the coastline, onto the beach, then splash in the ocean. The gentle horses have taken hundreds, sometimes thousands of visitors on breathtaking tours of the island. So as they say in Jamaica, "No worries, mon". 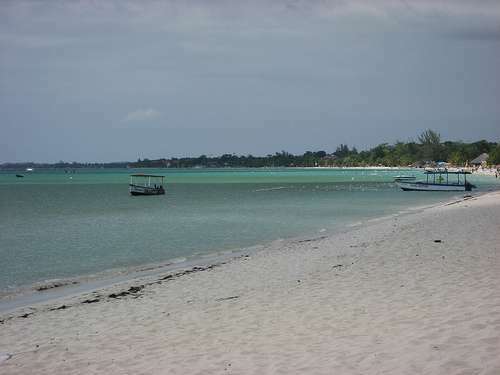 You can't come to Jamaica and pass up the world-famous 7-Mile Beach in Negril. With so much white sand, there's plenty of room for everyone to spread out and enjoy the sun. Stroll along the beach and you'll find all-inclusive resorts, hotels, villas, beachfront restaurants, water activity vendors and a few locals peddling their own merchandise. A polite "not interested" hand signal usually puts them at bay. This beach used to be a big hippie hang-out and you might still be asked if you want some grass, but mainly the beach is littered with families, vacationers, a few locals and some boozy party-types. The highlight of the day is the beautiful evening sunset. Sitting with your toes in the sand, gazing over the crystal water is a relaxing treat! 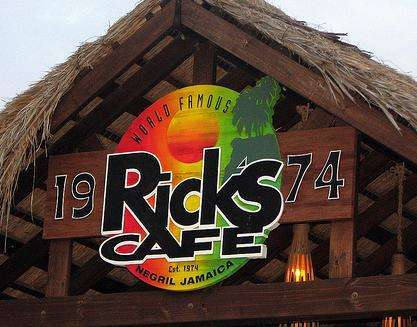 Since 1974, Rick's Café has offered visitors to Negril, Jamaica outstanding views from their cliffside location. Caribbean Travel and Life Magazine voted it one of the ten best bars in the world! Two hurricane's have destroyed Rick's but its popularity made for quick re-builds each time getting bigger and better. For more than 30 years, this spot has been the premier destination for gatherings and sunset gazing. By day, visitors can take advantage of the spacious decks, resort-style pool and diving cove. Adventure-seekers jump off platforms, the highest 35 feet above the sea, into the crystalline water below. The evening offers world-famous sunset views, Jamaican-style food and tropical drinks. When the sun slides behind the waves the party is on. With live entertainment and exotic drinks, Rick's is transformed into a moon-lit lounge. Getting to Jamaica and getting around. Our transportation tips will help make your trip smoother. More good sand advice. Proof of citizenship for Canadian citizens (passport or birth certificate with a photo ID). Passports required for U.S. citizens and citizens of other countries. All visitors must have an ongoing or return ticket. Vacationer's typcially fly into Sangster airport in Montego Bay. Kingston's Norman Manley airport is the second most highly used airport mostly for business or resident traffic. On the left - valid driver's license is required. Before making their way to Jamaica villas, vacationers like to know a little bit of helpful information to make them feel more at home during their stay. Take a look at our travel tips to make your time in villas in Jamaica even more relaxing. Jamaican dollar (JMD) - U.S. dollars widely accepted.